If you’re even slightly familiar with Drake men’s basketball, then chances are you recognize the name Dolph Pulliam. Dolph Pulliam lays the ball up against Lew Alcindor, now known as Kareem Abdul-Jabbar. After graduation, Pulliam remained a loyal voice for the Bulldogs men’s basketball team and mentor to hundreds of students. You may have seen him wearing a headset and a smile—and often, a blue leather suit—on the sidelines of men’s basketball games, where he provided radio commentary from 1969–1993. He resumed those duties in 2003 and carries them forward today. Indeed, Pulliam has been synonymous with the University and its athletics programs for more than 40 years. His contributions will be felt long beyond May 31, 2013, when he retires from his role as Drake’s director of community outreach and development. Dolph Pulliam came to Drake having played both football and basketball in high school. He found many of the skills he learned on the defensive line were transferable to the court. He was a “ferocious” rebounder, he says, and prided himself on being fairly physical on defense. Sports writers dubbed him one of the greatest defensive basketball players in the nation. A reporter for the Des Moines Register, the state’s largest daily newspaper, nicknamed him “Thespian” for his skill of misdirection. But when the game was over and it came time to hit the books, Pulliam was clear about his commitment to academics. He’d chosen Drake over a much larger Division I institution because he felt that school hadn’t placed enough emphasis on education, while Drake’s then-head coach had characterized academics as the most important aspect of a college career. 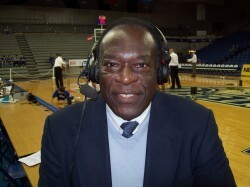 Pulliam at the broadcast table in Drake’s Knapp Center, 2009. 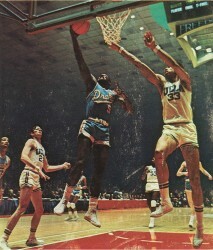 Pulliam graduated from Drake in 1969 but maintained his ties to Drake basketball. He was just one year out school when a local radio station, KRNT, named him the Bulldogs’ announcer. That allowed him the luxury of following the team at home and on the road. In 1989, he officially landed a job promoting Drake’s athletics programs. Though he transitioned out of play-by-play responsibilities in 1993, he held his role in athletics marketing for more than a decade before moving into a position as ambassador between the University and the people, businesses, and organizations within the Drake Neighborhood. He remained a regular fixture at Drake sporting events. One day in summer 2003, Pulliam was writing a welcome letter to the University’s new head basketball coach, Tom Davis. He never had a chance to finish the letter, because Davis walked into his office at just that moment. He wanted Pulliam to return to his broadcasting role—and more. With President David Maxwell’s support, Pulliam re-dedicated himself to the basketball team. He attended practices and traveled with the team, sharing stories on the court and in airline terminals and bus stations. He accepted this role in addition to that of a community outreach ambassador for Drake—needless to say, it took much of his free time. In 2007–08, Pulliam had the pleasure of seeing the team’s hard work, and his own, pay off. He wore a blue leather suit at every game as the team won the Missouri Valley Conference regular season title and tournament, advanced to the NCAA Tournament, and finished the season with a school best win-loss record. As Pulliam reaches the end of his Drake career, he says he’ll always be an avid supporter of Drake athletics. But he’ll be hanging up the commentator’s headset and, sadly, he’ll no longer be a fixture at practices and games. He’s fully expecting another alumnus of the basketball program to step in and mentor the team. Read more about Dolph Pulliam’s childhood, time as a student-athlete, career in the Des Moines media, and his many contributions to the University in the spring issue of Drake Blue, scheduled to publish in April 2013.